Princess Diana: Princess Diana Death: Trapped In A Web Of Spies! Princess Diana Death: Caught In The Spotlight of 5 Intelligence Agencies! 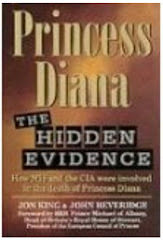 At the time of her death Princess Diana and Dodi Fayed were being monitored by no less than five intelligence agencies which included the following: MI6, NSA, CIA, Mossad and the DGSE! Why such intense interest by so many intelligence groups? Whether it was MI6 or Mossad who snatched the Mercedes a few weeks before the crash is a moot point at this juncture, however strong circumstantial evidence suggests that the car was tampered with so that it could be remote controlled when the time was necessary and that a small explosive device was installed which would be triggered at the right time (the detonation of that device might be the explosion that several witnesses claim to have heard immediately after observing a blinding flash (strobe light?) just before the Mercedes slammed into the 13th pillar. Why Would Israel Be Interested In Diana? Israel had every reason to be concerned about Princess Diana for the very simple reason she was set to marry Dodi Fayed who so happened to be an Egyptian and a Muslim no less! Furthermore Diana was increasingly becoming a voice to be reckoned with in international politics and had in fact been nominated for a Nobel Prize for her campaign to abolish land mines. It is very likely that Princess Diana egged on by Dodi Fayed could have brought a shift in perspective and focus on the plight of the Palestinians, spotlighting a harsh, cruel existence ironically reminiscent of the Nazi camps; a reality that is little reported by the much of the mainstream western media and something that Israel very much did not want the world to know! (which may explain why they so often "accidentally" shoot reporters and fire on U.N. troops). The General Directorate of External Security is France's foreign intelligence service and superceded the SDECE. It is nigh impossible that the logistics of this plot could have been achieved without French intelligence cooperation from the highest levels. But perhaps the strongest factor suggesting French Intelligence involvement was their silence in the face of the avalanche of accusations emanating from Britain in the aftermath of Princess Diana's death. France and Britain have been centuries old rivals (France supplied Argentina with the deadly and very effective exocet missile against Britain in The Falklands War) and it is more than likely that French authorities (DGSE in this case) would have gone well out of their way to discredit MI6 had they not been part of the plot...or at the very least they would have made a super-concerted effort to bring those responsible to justice if for nothing else than to absolve the French authorities for any perceived mismanagement of the investigation! The NSA (National Security Agency) of America has in its possession over 1050 secret electronic transcripts covering eavesdropped intercepts of Princess Diana's phone calls and conversations retained from other electronic bugging devices! It is not unusual for friendly secret service agencies to share intelligence on subjects of interest and in fact routinely MI6 makes requests of its bigger and more powerful cousins to keep an eye on British Royalty traveling abroad ostensibly for the royal parties own safety. However the extent of international intelligence surveillance of Princess Diana in the final months of her life far exceeded the norm. Certainly the amount of data that the NSA and CIA had on her was way beyond routine. It is speculated that one of the motives behind Princess Diana's assassination was her campaign to ban land mines which have had a truly devastating toll on children in Africa (maimed limbs). Though most of the responsible conflicts are long over thousands of unexploded mines still kill, injure and maim people everyday in those regions! When Princess Diana approached and got a firm assurance from President Clinton to enact a bill that would abolish the United States involvement in the trade of land mines, that move was likely the final nail in the coffin that sealed her death. She now had very powerful enemies across both sides of the Atlantic! By getting Bill Clinton to publicly state that he was going to take action against America's involvement in the trade of land mines she had angered the very powerful American arms cartel that includes very prominent right wing political families in America. In fact immediately following her death, President Clinton did an about turn on his promise to see a bill through that would abolish the trade of land mines. But the damage was already done and President Clinton was not going to be allowed to get off so easily either. As the rest of world watched on in sheer incredulity at the absurdness of the spectacle, the events to impeach the most popular and successful American president of the last 40 years dramatically unfolded! What should have been nothing more than a domestic issue was quickly turned into a national issue of gigantic proportions. So you can bet that if those individuals went after President Clinton in the manner they did, they certainly had no qualms aiding and abetting in the assassination of Princess Diana. Diana's anti-land mine campaign for which she had been nominated a Nobel Peace Prize was in direct conflict with the huge trans-global arms business (America as the biggest arms producer in the world is its center) and its consequential manufacture of wars in regions where they can test and sell their arms at great human loss but enormous profit! Such regions include Africa, The Middle East and South America! Princess Diana's murder and its subsequent cover up could and would never have happened had it not been orchestrated by the British Secret Intelligence Services, in this case MI6! That said, the faction in MI6 responsible for her death would never have taken action had they not been authorized from some one very high up in the monarchy...and no that does not mean the Queen! I have never believed that the Queen was involved in Diana's death and in fact contrary to public belief in the wake of Princess Diana's death, the Queen's actions were the strongest indication that she was not privy or part of the plot! People complained that the lack of any public display of anguish or sympathy for Diana's death from the monarchy was tantamount to an admission of guilt or complicity in her death. I think it was the exact opposite! If the Queen had been involved she'd have gone out of her way to show how saddened she felt by the princess' death and thus dispel any whispers of involvement. Besides she also warned Princess Diana's former butler (in a protective manner for his own good as opposed to a threatening manner) with the words "There are powers at work in this country about which we have no knowledge." But the fact of the matter is the Queen played it the way she saw fit and in the manner in which she was brought up, which with hindsight proved to be far removed from the expectations of the England of the day! Let's not forget that the Queen grew up in an era not known or long forgotten to many of us! Summary: MI6's involvement in this convoluted conspiracy is quite substantial and thus rates a post all of its own and will indeed be my next post!